How do I get my information and images to you? Login and create an account. Our website service is all online so you won't have to install anything on your computer. You will be able to enter account information, choose a website plan, and send us your information and images. Our system is written in plain english and is very user friendly, but if you have any questions, feel free to contact us. How do your free trials work? Our free trial allows you to see your own artwork on a sample website before you commit. Login and create an online account. Choose the Full, Mini or Business Portfolio Website. Enter your text and upload some images. When you are ready to see your sample website, click “Publish”. A link to your sample will appear in your account. Just click it to see your sample website. Your sample website will be available at that link for 15 days. You can decide to go ahead with a website at any time. When you're ready to go ahead, we'll send you a bill via email. Please make sure that the email address J@LuchtStudios.com is not blocked by your spam filter so you will be able to receive the email. Once the bill is paid, we will move the site over to your domain name. Can you setup my online account for me? Absolutely. Just contact us. We offer a concierge service for setting up and/or maintaining sites. Prices vary depending on the amount of work involved. I’m not very good with computers. Will I be able to use your service? Yes, absolutely. We understand you're an artist not a computer programmer. We try to make or system as clear and simple as possible. If you have questions, feel free to contact us for help. We’re happy to answer any questions you might have and walk you through the system if needed. How quickly will my site be online? You will be able to see your free sample website immediately. Once we receive payment for your "real" website, we will move the site over to your domain name. If we are registering your domain name for you, we can usually have your site up and running on your domain the same day. If you already own your domain name, you will either need to transfer your domain over to our service, or make some changes to your domain's DNS. Depending on what company you registered your domain with, the process may vary and can take a few days. We'll send you instructions when the time comes. Do I need to give you my credit card number when I create my account? No, absolutely not. Login and try out our system – no obligation. We won’t ask you for payment until your free trial is up or you tell us you are ready to go ahead. At that time we will email you a bill with payment options. Please make sure that the email address J@LuchtStudios.com is not blocked by your spam filter so you will be able to receive the email. We take PayPal, credit cards, and checks. Website hosting fees may be paid annually or monthly. If you pay annually, you have the option of paying with a check or money order, Visa, MasterCard, American Express, Discover, or PayPal. If you elect to pay monthly, payment must be made via PayPal – they accept all forms of credit cards as well as electronic checks (ACH). Setup fees, customization charges and at least one month's hosting must be paid in advance of the website going online. We will send your invoice to you via email. This email will come from the following address: J@LuchtStudios.com so please make sure that this address is not blocked by any spam filters you have installed. I want to pay for my site monthly. How do PayPal subscription payments work? If you choose to pay for your website on a monthly basis, you will be given a link to setup a PayPal subscription payment. PayPal will then automatically process a payment to us for your website on the same day each month. We do not send out reminder notices for monthly payments. Annual payments via PayPal can also be setup as a subscription. In these cases we will send you a reminder at least two weeks in advance specifying the date and amount of payment that will be automatically drawn through PayPal. Can I update the information and images on my website whenever I want to? Absolutely! In fact we encourage it. An up to date website is far more likely to attract attention from both visitors and search engines. With our service you can add, edit, update, and delete text and images whenever you need to – you can even choose a different template design or color for a fresh new look. Just login to your account, make your changes, and click “Publish”. I’m not sure which plan I'll need. Can I start off small and upgrade later? Yes, absolutely. You can upgrade at any time. Just contact us and we’ll get you all set up. We will pro-rate your bill for your remaining term. I already have a domain name. Can I use it with your websites? Yes, if you already have a domain name registered, we can still build and host your website for you. These sites usually take a little longer to get up and running because you will have to make some changes to your domain's settings. You can either transfer the domain over to our service or you can make some changes to your “DNS” settings at your current registrar. Every domain registration company deals with this a little differently, but we’ll be happy to help through the process. A domain name can only registered to one owner at a time. Therefore, a very common name like JohnSmith.com may not be available. When you are ready to go ahead with your website, we will ask you what you want your domain name to be. If you are unsure of how to choose a name, don't worry. We can also help you by suggesting possible options for you. You want your domain name to be easy to remember. We usually recommend that you try first for a .com name rather than a .net, .biz, or other suffix, because most people automatically type .com. A domain can only contain the following: letters, numbers, and dashes. Although they are perfectly acceptable, we usually try to avoid dashes because they are difficult for people to remember. Spaces and other special characters are not allowed in domain names. We also recommend that you first try for something that your customers will recognize, such as your name or your studio name. You can also try adding a term such as art or studio or a phrase that describes what you do. Some great examples of customers who have done just that are: www.LindaHollandStudio.com, www.JoshuaFrancoArt.com, www.JenkinsClay.com, www.LeahReadyDesigns.com, www.BrendasJewels.com, and www.GourdArtByNoreen.com. Is my domain name case sensitive? No, domain names are not case sensitive. So no matter what combination of upper and lower case letters someone types to get to your website, it will work. We do suggest that when you have business cards, signs, and other items printed with your website address, that you put uppercase letters where they make sense at the beginning of words. It just makes it easier for people to read and remember. For example www.ArtStudiosOnline.com. This can also help make things clearer when the domain contains a series of the artists initials such as Renee Brainard Gentz's site www.RBGentz.com or when the same letter appears two or three times in a row as in Terri Helmer's site www.ShimmeringGems.com or Dallas Josephy's site www.BeadedDesert.com. How large should my images be? We usually suggest that your images be at least 1000 pixels on the largest side. Bigger images are just fine. Our system will take care of automatically sizing them down for you and optimize them for display on the internet. However, if your images are smaller than 1000 pixels, do NOT size them up. Stretching your images to a larger size will only make them look grainy. Just load the images to your account at whatever size you currently have them. How large an image file can I upload? Most people should have no problem with files smaller than 10MB. If you’ve reduced your file sizes and are still having problems, please contact us. We’ll come up with a solution. What file format should my images be in? If you have image files in a different format, contact us and we'll make arrangements to get them from you. I'm having trouble getting my images to load what should I do? It is possible that your file size is too large and your internet connection is “timing out” before the files can get to us. Try reducing your file size. If you are still having trouble, contact us. We can walk you through the process or make arrangements to get your images some other way. When I zoom some of my images are smaller than the others. Why is this? The image you uploaded to us must have been less than 600 pixels (300 pixels on a mini website) on the longest side. We suggest loading images that are at least 1000 pixels on the longest side. If we receive an image that is smaller, we simply display it at the size received. We do not stretch images that are smaller because it ruins their quality. Are my images copyright protected? According the U.S. Copyright Office under current copyright law your work is protected from the moment it is “fixed in a tangible form that it is perceptible either directly or with the aid of a machine or device”. You can also register your copyright legally. More information about copyright laws can be found at the U.S. Copyright Office website. We post a copyright notice on every page of our websites. Images on the web are displayed at a low resolution which makes them rather unsuitable for reproduction and we do our best to disable image stealing techniques such as right-click and drag and drop. If you have photo-editing software, it is also very simple to embed a watermark in your images. Just be aware, there is no fool-proof system for preventing copyright infringement. Unfortunately, it is always a trade off. You want your work to been seen in order to sell it, but that means that someone may steal your ideas. For most of us the benefit of having our work seen outweighs the risks. Can I track my website traffic? Yes, absolutely, our websites can be setup with “Google Analytics” at no extra charge. You will need to create a free Google Analytics account at www.Google.com/Analytics. Follow their instructions and at the end they will give you a piece of computer code. Email this code to us and we will install it on your website. You will be able to view your reports by logging into your Google account. What can I do to drive more traffic to my website? A website is a business tool, much like your business card. You cannot build a website and expect the sales to magically flow in. You need to actively promote your website in order to drive traffic there. Search engines look for relevant text content - they want to know that you are an authority in your field. This means that websites that have more informative, relevant text are likely to perform better. Search engines can't really "see" images. This is a big problem for us artists. This means it's even more important for us to talk about our artwork. Make sure your image titles and descriptions provide plenty of information about each individual piece of art. It is much more difficult to score highly for generic terms such as “Art” or even “Abstract Painting”. By all means use these generic terms, but also include more specific terms about your work such as “Batik” or “Egg Tempera”. The more specific you can be, the better. Fewer people may search for the terms, but you should rank higher when they do. Do not, however, haphazardly stuff keywords into your text, just tell the story of your work in as natural a manner as possible. If there is something particularly interesting or special about your technique or your work, talk about it. This will not only provide more content for the search engines, but also be more engaging for visitors to your site. Tell anyone and everyone you have a website. Print your website on your business cards, carry them wherever you go and, this is key – Give Them Out. Put your website address on all business stationary you have printed. This means business cards, letterhead, signs, bags/boxes, hang tags, postcards, show invites, etc. When you have postcards printed for a show, include your website and a line inviting customers to preview your work on the website before the show. It is also very helpful if you get your website up to date at this time – if the work on your website is not the same or at least representative of the type of work you are going to show, people may be confused. Add your website address to the signature line of your email. If your website program allows, make it clickable. Ask any shows you are doing, galleries that feature your work, or guilds/professional groups, etc. that you belong to, to link from their site to yours. Links from sites related to art and your particular medium carry the most weight with search engines. Avoid links from websites that look like “link farms” or that have no relevance to you or your artwork. If you have ties to an educational or government institution, see if you can get them to link to your website. Links from .edu and .gov domain names are thought to carry more weight because these domains are not for sale on the open market. Try your state or county arts alliance or the college where you teach art classes. Make sure you list your website on any press releases and in any newspaper or magazine articles you write or have written about you. Keep your website content fresh. Search engines (and art collectors) like to see websites that are up to date. How long will it be before my website is “indexed” by the major search engines? I received an email from someone who claims they can boost my search engine ranking, what should I do? There are legitimate businesses that specialize in what is called “Search Engine Optimization”. It has been our experience, however, that most of them do not send out random emails to website owners. Be wary of anyone who claims they can guarantee you top search engine results. No one can do that. Some tactics employed by these unscrupulous companies can even get you blacklisted by search engines. Rather than paying someone hundreds or even thousands of dollars for search engine optimization, we recommend that you look closely at the content on your website and make sure that it is keyword rich and relevant. In addition, you should seek links from organizations and associations related to your art. We offer all sorts of information regarding search engine ranking and how you can make the most of your website on our Blog and there's an added bonus – the information is free. Can I add e-commerce for online sales? Yes. Business Portfolio Websites come with PayPal “Buy Now” Buttons included and Artist Full Websites can add them for a nominal fee. How do the PayPal “Buy Now” Buttons on my site work? Fill out the basic information to get an account. Skip the part where they have you create your buttons- We've already done that for you. Your PayPal account is tied to your email address. We'll need to know what email address you used on your Paypal account. Then when someone clicks to buy an item on your website, they will be sent over to PayPal's website to complete the transaction. PayPal will email you to let you know that you've had a sale. Follow their instructions on how to proceed from there. How do I setup the Buy Now buttons on my website? You don't have to. If you've added the e-commerce feature to your website, our system takes care of building the buttons for you. Any items with a price line that starts with a $ will get a button. How do I setup shipping rates and sales tax on purchases? Sales tax and shipping can be setup through your PayPal account. Go to www.PayPal.com and login to your account. Both shipping and sales tax can be setup in the "My Selling Tools" section of your Profile. If I sell something from my website, do you take a commission? No. All sales are between you and your customer. 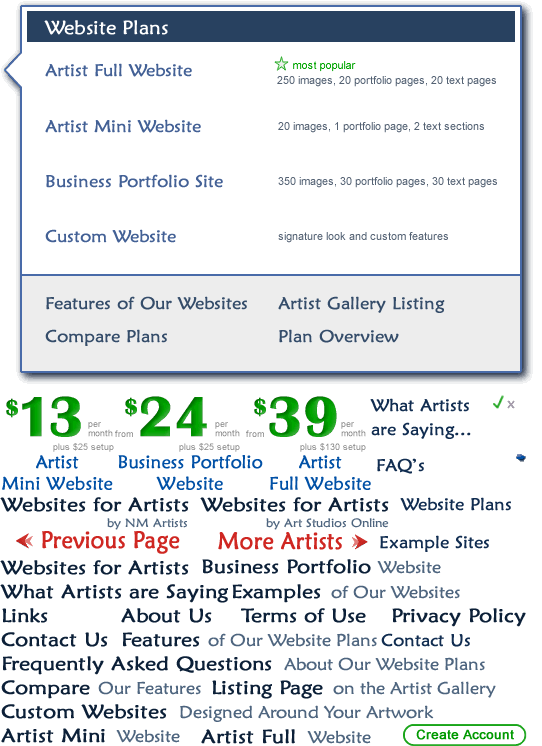 We charge a fee for PayPal Interface added to Artist Full Websites. PayPal also takes a fee to process your sale much like any merchant services provider- see PayPal's website for their terms and conditions.